This historically significant site commemorates the location of the first railway in British Columbia. This small park is the site of the Seton Portage tourist information centre, which is housed in an old railway caboose. 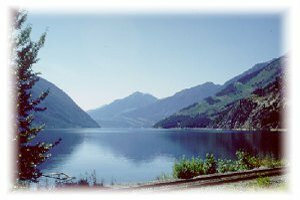 70 km west of Lillooet on the south side of the Seton River; access is via gravel road from Shalalth to Seton Portage. The park is located between BC Railway and the road connecting Shalalth to Seton Portage. History: Established March 29, 1972. The land comprising the park was donated to the people of BC by the British Columbia Railway. Cultural Heritage: The historic site lies on an important route out of the lower mainland, used at the time of the Gold Rush and commemorates the first railway in the province. The portage was created about 10,000 years ago when a large landslide occurred dividing the then existing lake into two separate lakes. Alexander Anderson, a fur trader with the Hudson’s Bay Company, was one of the first explorers through this area. He was looking to establish a travel route from Kamloops to Harrison and back up the Fraser. He was responsible for naming the two lakes. One he named after himself. The second he named after his cousin Major Seton, who was a troop commander of the 74th Highlanders. The 3 miles of railway was constructed in 1861 on wooden rails to facilitate the transport of goods and miners between the two lakes. In 1915 the line was completed to Lillooet and became a bustle of activity. The management plan was approved in 2012 by BC Parks. The Seton Portage Historic Park Management Plan [PDF 1.17MB] – November 2012.